The castle is reputed to be the site of a buried hoard of treasure, to find it you must run around the castle three times, and where you stop the treasure will be found. Unfortunately there is no indication of where you should start. It was the home of Richard III, and late in the 20th century three children heard the sounds of battle outside the castle, and saw a knight on horseback, who charged them before disappearing into thin air. 16th century music has also been heard in the castle, but distantly. The story goes that there's supposedly a tunnel leading between Richmond Castle & Easby Abbey, & the troops sent the drummer boy down the tunnel at the Castle to see if it did indeed lead to the Abbey. The drummer was supposed to walk the tunnel & beat his drum all the way along so that the troops could follow the sound & track the direction of the tunnel. A little way along, the drumming faded & stopped, & the drummer boy disappeared completely. It is thought that the drummer boy could have fallen in a hole the some of the roof had caved in on him. Quite a lot of people still claim you can hear drumming around the Abbey/Castle sometimes. Ravensworth Castle is a ruined 14th-century castle in the village of Ravensworth, North Yorkshire, England. It has been designated a Grade I listed building by English Heritage. The earliest reference to the castle records a visit from King John in 1201. 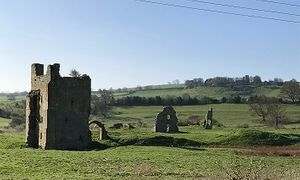 The remaining parts of Ravensworth Castle date from the late 14th century, when it belonged to Henry, 1st Baron FitzHugh. In 1391 he enclosed 200 acres around the castle, creating a park. The castle started to be pulled down in the 16th century, and the stone was used for other buildings in the area. Ravensworth Castle and Park Wall were given a Grade I listed building designation by English Heritage on 4 February 1969. The Grade I listing is for buildings "of exceptional interest, sometimes considered to be internationally important". Many disembodied sounds have been heard from the castle at night along with lights being emitted from the remaining building. 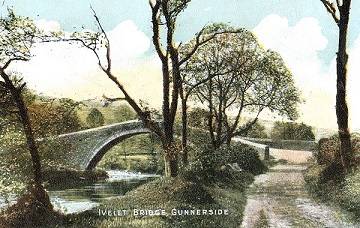 The Bridge over the River Swale dates from 1687 and was an important crossing point on the 16 mile Corpse Way from Muker to the Churchyard at Grinton, which was once the only consecrated burial ground in the dale. Along the Copse Way were identified resting stops for the men carrying the bodies which were normally entombed in wicker baskets. When the men stopped overnight the bodies were placed in building called a ‘Dead House’, such as can be found at the Punchbowl Inn at Feetham, but for shorter breaks the pall bearers would place the body upon a coffin stone whilst they took a rest. One of these coffin stones is on the north side of Ivelet Bridge. Ghostly goings-on at the hall are reported to include footsteps and sobbing and crying in a drawing room, a Victorian woman seen walking the staircase and a 1940s airman in the kitchen. Many visitors and volunteers have also smelled pipe smoke in an old kitchen and a hint of cologne has been detected in another drawing room.